NATO's easternmost member state is threatening to undermine the alliance from within. 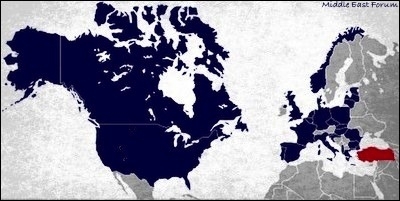 Created in 1949, NATO's founding principles ambitiously set out the alliance goal of "safeguard[ing] the freedom, common heritage and civilization of [member states'] peoples, founded on the principles of democracy, individual liberty and the rule of law." In other words, the alliance exists to defend Western civilization. For its first 42 years, until the USSR collapsed in 1991, this meant containing and defeating the Warsaw Pact. Today, it means containing and defeating Russia and Islamism. Islamism has effectively succeeded fascism and communism as the great radical utopian challenge to the West. Of these latter two, Islamism is the deeper and longer-lasting threat, being based not on a single leader's personality but on a highly potent ideology, one that effectively succeeded fascism and communism as the great radical utopian challenge to the West. 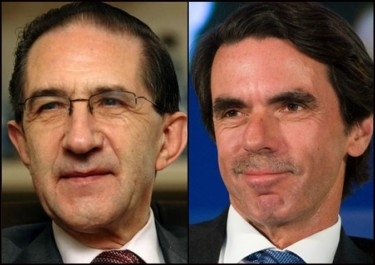 Former NATO Secretary-General Willy Claes (left) and former Spanish Prime Minister José María Aznar wanted NATO to focus on Islamism. 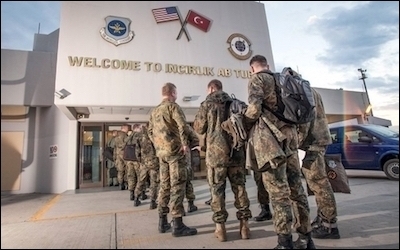 The entrance to Incirlik Air Base in Turkey. Maltreatment of NATO-member state nationals hardly bothers the NATO worthies: Not the arrest of 12 Germans (such as Deniz Yücel and Peter Steudtner) nor the attempted assassination of Turks in Germany (such as Yüksel Koç), not the seizure of Americans in Turkey as hostages (such as Andrew Brunson and Serkan Gölge), nor repeated physical violence against Americans in the United States (such as at the Brookings Institute and at Sheridan Circle). NATO seems unfazed that Ankara helps Iran's nuclear program, develops an Iranian oil field, and transfers Iranian arms to Hezbollah. Erdoğan's talk of joining the Moscow-Beijing dominated Shanghai Cooperation Organization ruffles few feathers, as do joint exercises with the Russian and Chinese militaries. A Turkish purchase of a Russian missile defense system, the S-400, appears to be more an irritant than a deal-breaker. A mutual U.S.-Turkish ban on visas fazed no one. A unified stance against Erdoğan's hostile dictatorship permits the grand NATO alliance to rediscover its noble purpose of "safeguard[ing] the freedom, common heritage and civilization" of its peoples. By confronting Islamism, NATO will again take up the mantle it has let down of late, nothing less than defending Western civilization.